On a normal day, the Explore community might witness hyenas unsettling an elephant herd on the live cameras at Mpala, the home of African wildlife. 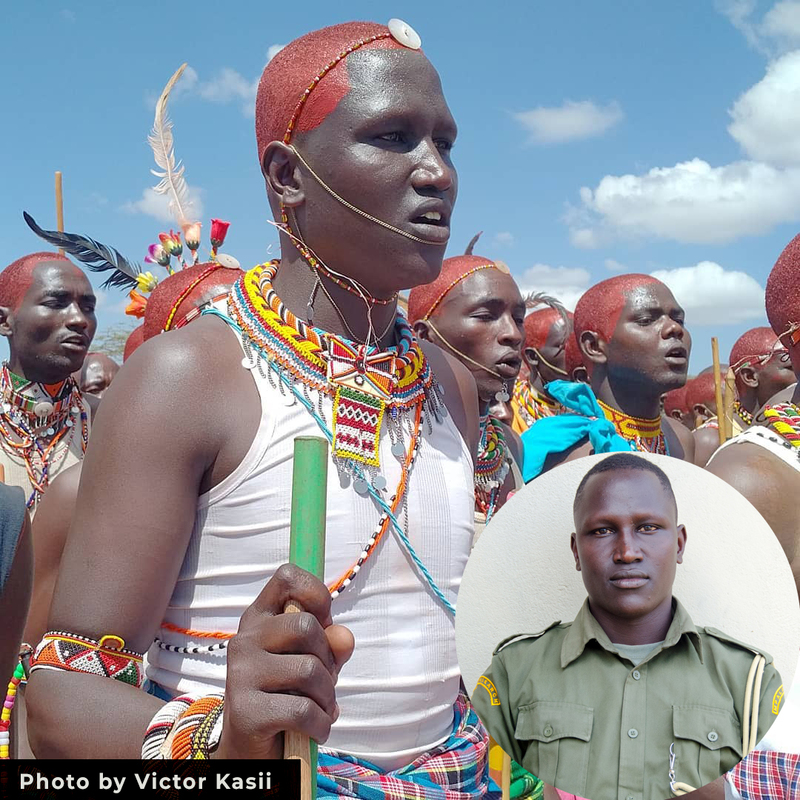 Behind the scenes, a ranger at Mpala is likely to be watching from a distance riding in the back of a cruiser during a security patrol loop along the Ewaso Ng’iro river that cuts through Mpala Research Centre in Laikipia, Kenya. 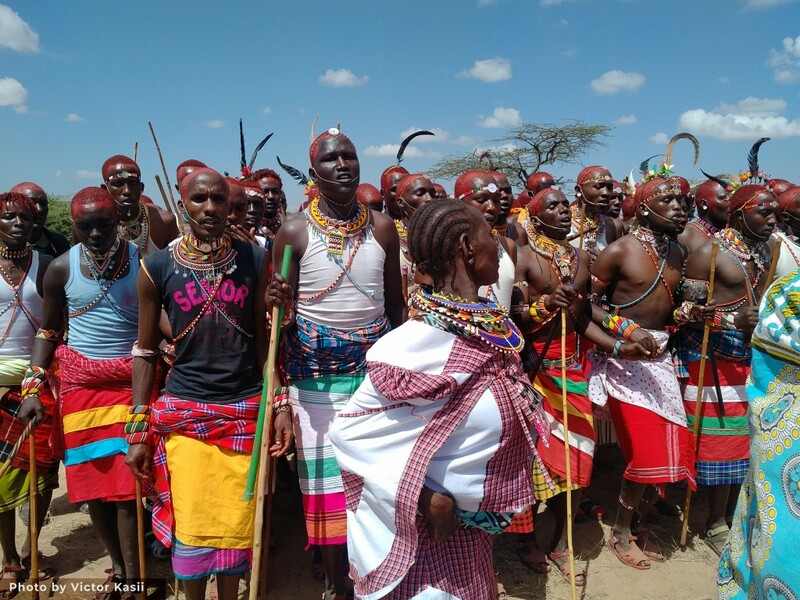 But, today, the action is happening further north and the ranger has transformed into a Maasai warrior. He is part of an advancing group of Morans (Maasai warriors), adorned in bright and colourful beads, heads covered in red ochre, necks and arms rhythmically swaying to a chant and a chorus, their feet synchronised in confident steps approaching a Manyatta (the traditional Maasai homestead). Well above the rest, I recognise James Metiaki’s 6’2″ frame. He tries hard not to smile when he sees his colleagues from Mpala at his home among at least 1000 other people gathered for the ceremony. “Today, we are ushering in a new age-set into eldership,” said Matiaki. “This event takes place every five years.” Metiaki together with other incoming junior elders go on to gift their seniors with cash and cloth in a colourful event spectacularly marked with song, dance, food and a local brew made out of aloe vera roots and honey. The Maasai community has held on to traditions that govern their way of life–including wealth distribution, law and order, marriage, rites of passage and discipline–for centuries. Metiaki is part of an age-set that is transitioning into a council of junior elders, paving way for a new crop of Morans (warriors). The age-group ahead of his is also graduating and taking over the leadership mantle by becoming elders. These are the people that make all the decisions, including when the families can migrate in search of greener pastures for their livestock. “We thank Mpala for supporting us not only in this event. Our children are learning how to conserve our dwelling place, the older ones who have completed school are getting jobs as research assistants and I can see others who have scholarships already going to universities. We also get grass for our livestock when things are tough,” says the incoming elder chief, Joseph Ole Kaparo. For the next five years, Ole Kaparo will be the spokesperson and the face of the community. He will govern and interact with neighbours including Mpala and other stakeholders. For today’s special occasion, Mpala has donated a bull to feed the warriors and guests. We are here to witness this spectacular event and celebrate with the Maasai community. Ole Kaparo acknowledges the impact of Mpala’s educational outreach on the community through the Northern Kenya Conservation clubs and the MpalaLive.org program. The work cements the importance of inspiring a new generation of conservationists by providing much-needed access to educational material. There are at least 800 school-going children in communities neighbouring Mpala who come into direct contact with the curriculum hosted on mpalalive.org through the generous support of Explore. On the ground, the web cameras in the wild viewed by the Explore community form the core of an education outreach program aimed at empowering viewers and visitors with facts about the animals of East Africa as well as the natural world around them. Detailed descriptions, illustrations and video are part of the interactive field guide on mpalalive.org that provides exhaustive information on 88 species viewable on the live cameras. Our home county of Laikipia is a special place. It is not only the home of African wildlife on Explore but communities made up of some 400,000 people including pastoralists, ranchers and farmers live here too. Straddling the equator, Laikipia is part of the Great Rift Valley with an area of 3,653 square miles (9,462 square kilometres). The rich and diverse plateau’s climate is typically dry and cool and has many unique habitats including grasslands, savannah woodland, and forest. It is here that people and wildlife coexist. Much of the research conducted at Mpala looks at how to make that coexistence a positive experience for all. At the end of the day, Metiaki and the warriors are now junior elders. Metiaki heads back to his duty station at Mpala, now an elder and a ranger. At Mpala Live, we wish him and his fellow rangers all the best.